HP's ProLiant DL380 Gen9 leverages the latest processor, memory and storage technology in a highly reliable, serviceable, and expandable 2U chassis. Flexible and fast 12Gb storage options and scalable I/O capabilities are among the improvements in this data center standard. As the latest release of one of the most popular rackmount servers, the Gen9 DL380 builds on a proven model to allow you to run everything from the most basic to mission critical applications in confidence. Significant performance and energy efficiency gains over previous generations and superior scalability make the DL380 Gen9 a perfect option for businesses looking for a system that can adapt and accommodate your increasing computing demands. Powered by dual Intel Xeon E5 2600 v3 product family processors for up to eighteen cores and 45MB cache per cpu, the DL380 Gen9 can tackle your most compute-intensive applications. With a total of 24 memory module sockets to scale up to 1.5TB total DDR4 RAM running at a maximum of 2133MT/s, the DL380 Gen9 is perfect for your growing virtual server infrastructure. Aventis Systems offers the DL380 Gen9 in four different chassis options: the 8-bay 2.5" hard drive model, 24-bay 2.5" hard drive model, 12-bay 3.5" hard drive model, and the 4-bay 3.5" hard drive model. Invest today in your ever-increasing IT demands with the DL380 Gen9! 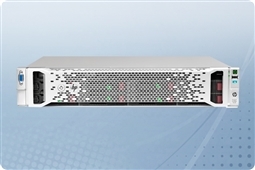 Aventis Systems carries New HP ProLiant DL380 G9 servers. All servers from Aventis System include a 3 year Comprehensive Warranty, with eligibility for optional Express warranties and onsite services. Are you looking for an HP ProLiant Gen9 server with similar processing power and memory footprint in a more dense form factor? Please browse our DL360 Gen9 1U rackmount servers. Do you have a question? We’re here to assist you! Please call us at 1.855.AVENTIS (283.6847) or use our Live Chat Live Chat during regular business hours. You can also email us at Sales@AventisSystems.com.